March is over, and my 3rd pair of socks for the year, slipped in, just under the wire. All the knitting was done by 6PM—after dinner, came the work of weaving in. Normally I try to do some weaving in as I go—but not this time. 6 colors, 12 sets of ends to weave in for each pair! But it went quickly—and with hours to spare—a pair (of socks) ! I decided on a round toe—for no other reason, than-- I almost never do a round toe. Its a simple 6 armed swirl-the first few decreases were 6 per round, ever 3rd round –so just as 4 decreases ever other round requires 6 rounds (decrease 4, one round plain X 3) this was decrease 6, 2 plain rounds X 2. When I was half done, I changed the pattern to decreases (6 per round) every other round- when 6 stitches I bound off drawstring style. 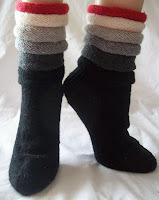 The black held out-- for 1 sock 8 inches of yarn was all that was left--(the second had a whopping big 2 yards left over!) A good deal—the idea of these sock was to use up partial balls of yarn.. I still have some red, (I knew I would, I have plans for it)--the same goes for the white, I barely made a dent in the greys—so I will have to remake these sock again next year with a nice blue as the first color in the stripes. I'm likely going to take a breather—yesterday was a rainy day—and there are threats (not likely to amount to much in the city) of snow. It's the last squalls of a long winter—and I've caught a cold. I've been feeling off for a few days—cold and tired and just well not right. Today, a scratchy throat, sneezing, runny nose and coughing started. I'll keep warm, and take my vitamin C and fluids, (onion soup and chicken soup and fruit juices) and well, be as right as rain in a few days. I'll get the grey yarn balled up and divided, and maybe work on a mindless hat –there is a always a hat needed for some project or another. But likely there is also going to be some sleeping in, and coddling too. I am reminded of when I was in HS and it was popular to wear several pairs of different colored socks to match your outfit. These socks are a much classier option!